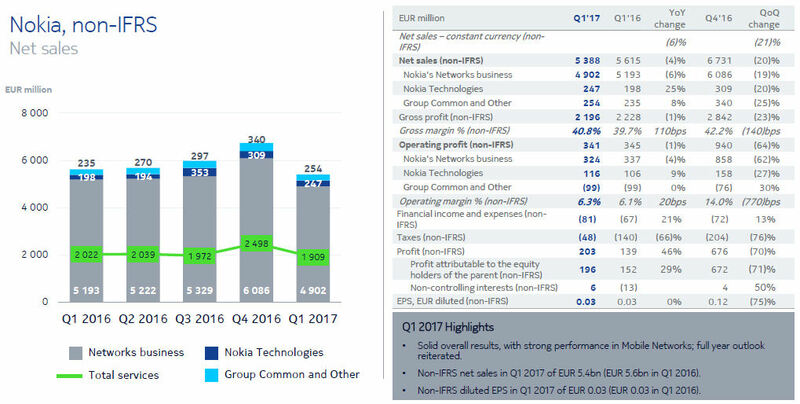 Q1 2017 was all about steadying the ship for Nokia and it speaks volumes about its competitive environment that a slower decline in revenues is viewed as a win. Nokia’s non-IFRS (excluding items related to the Alcatel-Lucent acquisition) net sales for the quarter were €5.4 billion, which represented a 4% decline on the same quarter a year ago. In the previous quarter, however, sales declined annually by 13% so at this rate Nokia might just start growing again before long. The vast majority of Nokia’s revenues come, of course, from the networks unit, which declined by 6%. The biggest contributor to that is Ultra Broadband Networks, of which Mobile Networks is the dominant component. Mobile was pretty much flat year-on-year and it was the fixed, IP routing and optical side of things that brought the average down, implying the Alcatel-Lucent part is relatively underperforming. Nokia technologies is on the up thanks mainly to the HMD Global licensing arrangement and the acquisition of Withings in Q2 2016. The others section remained steady. “Nokia’s first quarter 2017 results demonstrated our improving business momentum, even if some challenges remain,” said Nokia CEO Rajeev Suri. We slowed the rate of topline decline and generated healthy orders in what is typically a seasonally weak quarter for us. We also continued to see expansion of cross-selling across our full portfolio, delivered excellent gross margins and improved group-level profitability. “Mobile Networks was clearly the highlight of the quarter. A combination of robust market interest in our advanced LTE solutions, including closing the quarter with 145 4.5G customers, and ongoing cost discipline allowed us to get closer to stabilizing our topline while delivering improved profitability. “Fixed Networks, which had an excellent 2016, was impacted by several large deployments coming to an end. Despite this, we are seeing growing traction in cross-selling in markets where Nokia has traditionally been strong, and are continuing to invest in the promising cable market. “In IP/Optical Networks our business is heavily weighted towards communication service providers, and that market is currently quite soft. We are making good progress in expanding our business to new customers, including large internet companies where growth is strong, and expect that a coming IP product refresh will strengthen our competitive position. On the whole these numbers seem to be a step in the right direction, especially if the corrective measures proposed for the fixed business bear fruit. Nokia’s NASDAQ shares were up 8% in pre-market trading at time of writing and, while the challenge presented by Huawei is still considerable, at least Nokia is doing better than Ericsson right now.